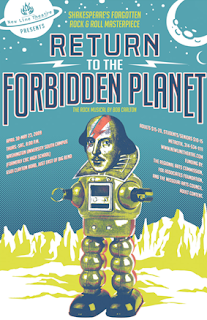 Return to the Forbidden Planet is wacky and chaotic on the surface, but it’s also really smart, retaining the serious themes of its earlier versions, William Shakespeare’s The Tempest and the 1956 film Forbidden Planet. 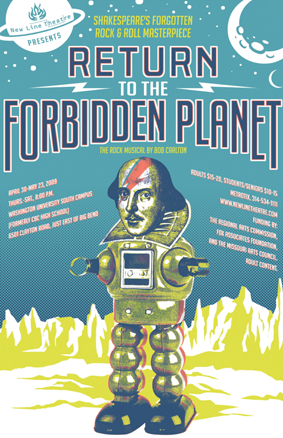 Just like the film and the play, Return to the Forbidden Planet is about the idea of expanding human consciousness with technology (or Jedi-like magic in the original play), unknowingly releasing the dangerous power of the human id, and thereby butting up against that timeless and universal truth, that power corrupts and absolute power corrupts absolutely. Today, more than ever before, we are developing many new technologies that literally expand the boundaries and power of human consciousness, through the internet (and its various applications, Facebook, Wikipedia, YouTube, and so many others), the iPhone, the Blackberry, and more devices coming every day. Dr. Prospero’s discovery and use of “telegenesis” is a clear metaphor today for the creation of blogs, viral videos, online discussion groups, social networking sites, and much more. Not only does human consciousness now extend beyond our physical selves, it extends around the globe. A blogger’s voice, his thoughts and ideas, are instantly materialized in every corner of the planet, and we’re getting closer and closer to those ideas being instantaneously translated, so that even language will no longer be a barrier. We’ve only begun to understand what this revolution means. It will change the world as much as electricity and television have. Moore’s Law says that the microchip doubles in capacity every eighteen months (this pattern has held since 1958). With that in mind, imagine what technology will look like in twenty-five years, and Dr. Prospero’s Id Monster suddenly seems a bit less ridiculous. Return to the Forbidden Planet has at the center of its tale the biggest of all moral questions: should we restrict or block science, even when it crosses into moral gray area? Dr. Prospero’s discovery seems to him a giant step forward for humankind, an expansion and extension of human consciousness greater than any that has come before. But he doesn’t foresee the inherent downside, that he would greatly intensify the mind’s power without also greatly increasing the mind’s ability to control itself. It’s a problem illustrated by the old joke, “Don’t think about an elephant” – it’s nearly impossible to do because the mind is hard to consciously control. In any arena, increasing power without increasing control usually leads to disaster, and it’s a problem we keep bumping up against as we continue to evolve. Decades ago, we discovered nuclear power, but we still can’t control or contain it. The world’s greatest fear today is that Iran or North Korea or, worse yet, a band of rebel terrorists, will use a nuclear bomb. We increased our power without sufficient control. We invented the internet, wildly expanding the reach of human consciousness, but with it came online predators, the loss of privacy, and the erosion of the idea of copyright. Again, we increased our power but we still can’t control it (though some believe the internet should never be controlled). And two of the newest technologies, gene mapping and embryonic stem cell research already scare people who foresee cloning and “designer babies.” This is the real issue at the heart of Return to the Forbidden Planet, and it’s why this remains a fascinating story.